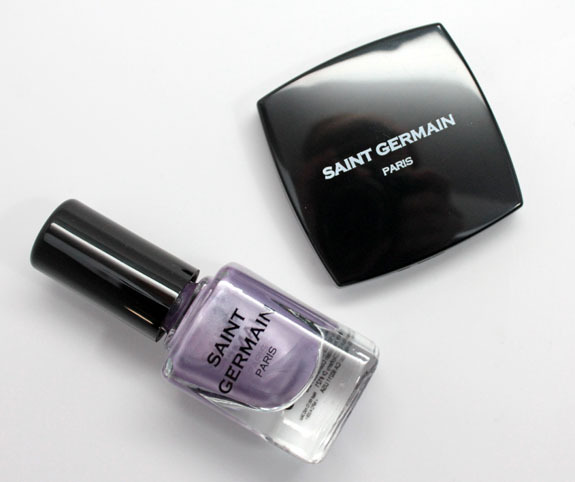 Have you heard of Saint Germain Paris makeup yet? They are an affordable range of cosmetics with a Parisian flair. Their products include items for the face, nails and eyes and they are cruelty free, vegan and gluten free. Their line includes eyeshadow duos that come in seven different shades. They also have twenty-two shades of nail polish that come in a variety of finishes and shades. Purple Silver is a pale lavender frost. Oh how I wish this wasn’t frosty. The formula of the polish isn’t too thick or too thin, but unfortunately because of the frosty finish, it’s pretty streaky. Plus it just looks dated to me. Frosty nail polish is one thing I would happily leave in the 80’s. The color itself is nice, but the finish killed it. This was two coats. Purple Blue/Night Blue features a pale cool lavender shimmer on one side and a deep smoky blue/purple on the other. 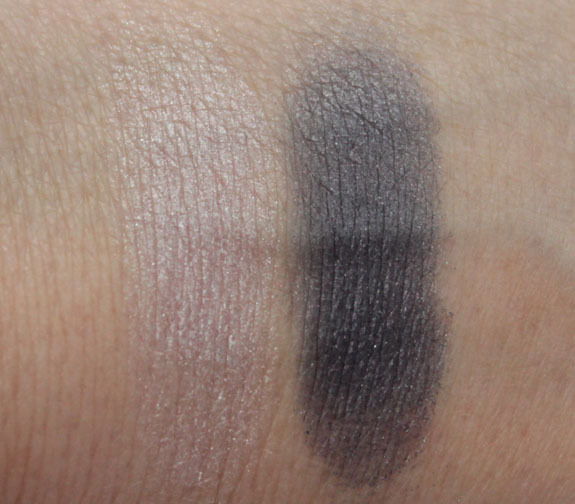 The pale lavender shade barely showed up when I swatched it without a primer. With a primer it’s still very pale. The Night Blue shade is nicer and more pigmented. I like the greyed out look of it. The texture of the shadow is good. Not the softest shadows ever, but certainly not chalky or gritty feeling. I just wish they had a bit more pigmentation without having to work so hard at getting it. Overall: I don’t like to judge an entire brand from just seeing two products, but I don’t feel like either of these were that great. I think if the nail polish had not been a streaky frost it would have been nicer. The eyeshadow only had one color that was decently pigmented and that was after many swipes of it. Then again the pricing for these isn’t expensive either! 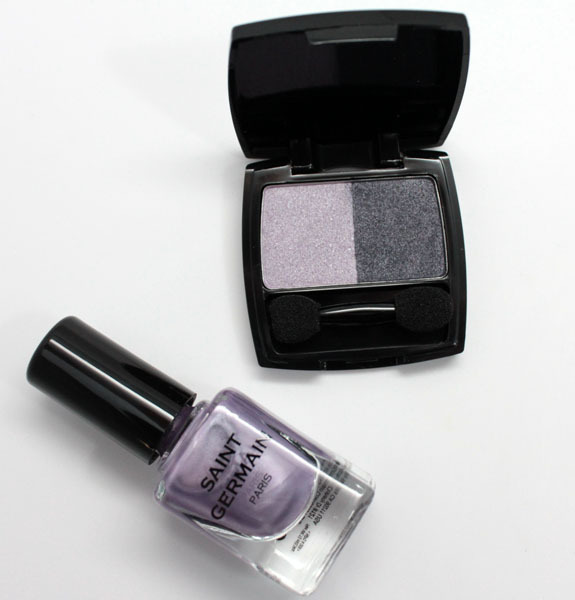 Pricing: Nail polish ($4.95 for .34 oz), eyeshadow duo ($4.65 for 0.06 oz). Have you heard of Saint Germain Paris? Note: Saint Germain Paris is a cruelty free brand. Love a Summer Picnic? How About a LUSH Strawberry Picnic? I’ve been to St Germain in Paris, and I didn’t think there were a lot of affordable things in that neighborhood 🙂 Both the eyeshadow and the polish look like they’re from the ’80s. I didn’t realize nail polish needed to be gluten free. As it stands these are just…underwhelming. There are so many good options for affordable make-up these days that it’s hard to give it a pass because of the lower price point. Some people who have full-on celiac disease steer clear of gluten in any products. Some people who have gluten sensitivities just avoid it in food, it all depends. My fiance has celiac and he uses a gluten-free shampoo – which stopped his scalp from feeling itchy and on-fire all the time. I think it really just depends on how sensitive you are and figuring out what works for you. Saint Germain Paris is new to me. Wonder where they will be carried? I just reviewed these same two and agree with you on most of your points. The frostiness just wasn’t for me on the polish. I did really like the color of Night Blue, though! Not a big fan of these items. Very exciting, I love trying new lines! They look like they’re from the 80s… especially the polish! I agree with you on the nail polish. The color looked pretty in the bottle, but the frost finish ruins it. Wow, that polish is so frosty! 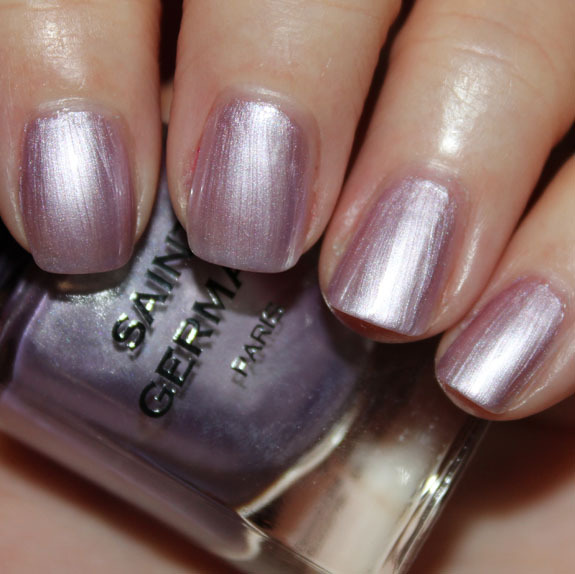 I don’t mind metallic polishes with a bit of frost, but when they have this much, the visible brushstrokes annoy me. Thank you for the heads up, Kelly! This is something I would totally pass on! Too bad that polish is all frosty 80’s! Yuck! It looks rather pretty in the bottle. I might check out their other products/colors though. I received a nail polish is a pale pink from them, and it was streaky awful. The color was kind of a putrid too. I also received an eyeshadow duo in lagoon. I thought the shadows were pretty hard to work with and didn’t look very nice. However, I also received a liquid liner, and I did like that. So maybe some products are better than others. A bunch of my friends and I (all vegans) were really excited to check out this brand, since they claim to be an all vegan brand. Then we looked at the ingredients, the lipsticks and lip balm all contain beeswax, and the eyeshadows may contain carmine. So not actually vegan. I’m glad the products aren’t great, it makes me less inclined to care that they lied. The tone of the color is just right for me. Not too dull ! Thanks for the great review!